Wow! What a month! The car has been run in (now covered 750mi) and I'm thoroughly thrilled with the driving experience. I took it steady for the first 500mi or so and ramped it up from there. When I started to open it up, I found that the car offers such exhilarating performance it's rather difficult to drive it sensibly! 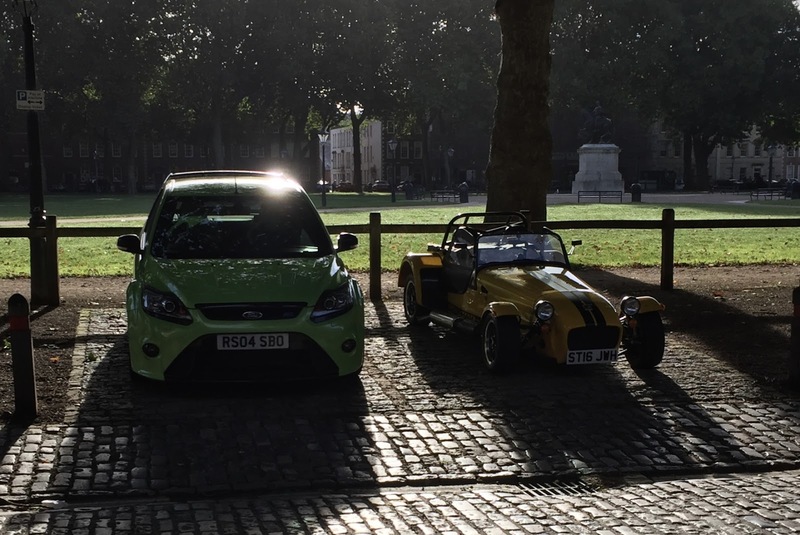 Corners that used to be 'corners' in other cars the Caterham (now named Stiggy due to the plates) takes far faster than ever before without it really feeling like a corner. The acceleration is a whole new experience; my ST is quick, but this is a totally different experience. The immediacy (due to being NA and not turbo charged) is what stands out for me, there is instant throttle response. That response teamed with the wind in your face makes it all the more fun. A half hood - very nice quality from Thundersport. Much, much easier to put on than the full hood and great for passing showers. A quick release steering wheel - I very quickly found that getting in and out was rather challenging! That, and the fact I didn't really want to leave the car anywhere but the garage fuelled this purchase. Not that installing the QR wheel was easy! Getting the old upper steering column out took some ingenuity (aka more strength than I possessed). Then getting the upper mounting bush back in the dash, I went too far and ended up with a bush wedged a fair way down the outer steering column. After sawing through the bush to remove a piece and crush it, I managed to pull it free. A replacement bush from Caterham worked a treat the second time. I would probably advise that these bushes are a one-use item (only £7.50ish); I think I damaged the locating features on removal and so it didn't locate when I tried to replace it. Velcro pads on the harnesses - these are dead useful in stopping the pull tabs from the harness whipping you in the face while driving! New mirrors - a smaller pair of mirrors that fit onto the windscreen stanchion, so they are available doors on or doors off. The size is much more in keeping with the proportions of a Seven and they don't vibrate as much either! Sorry for the lack of any decent pictures, but here are a few from the Queen's Square Bristol Breakfast Club to make up for it! Who knew there were so many cool cars in Bristol! Including a P1! The lack of updates for the last few months, is entirely due to the fact that I have spent these months waiting for VOSA and the DVLA before being able to collect my Caterham. A word of warning for anyone building a Caterham, the build takes 2-2.5 months, but getting it on the road took me 4 months! Whinging aside, the car is amazing! What a driving experience! Upon collection I almost mistook another 270 for my car - it was back to back with a car with almost identical spec; good taste! Getting the plates on was a quick job (3M dual lock pads) and made it all become very real! The drive back to Bristol used a carefully selected route, avoiding motorways and incorporating some great twisty sections. The car really came alive in the twisty sections and as the exhaust warmed up the pops and burbles on the overrun were very amusing. Thanks to my dad for trying to keep up in my Fiesta ST (I'm sure he had fun really), which also managed Bristol to Crawley and back on less than 3/4 of a tank. I did relent and let Dad have a go over the last few miles; it was great to see and hear the car while following it. Good 150mi on the clock getting the car run in, roll on some more trips in the sunshine! Bad news all 'round this week. The car failed the IVA. The prophecy from the guy collecting the car has come true - estimating about 85% fail first time. Retest 23rd of June, just in case that date needed any more drama! The car successfully passed on the 23rd of June. I believe Caterham installed a restriction in the brake line, such that the entire pedal feel was much firmer - to please the IVA examiner. All the forms are now in the post - roll on collection day! Following the car's collection it was scheduled for the PBC. I can report that Caterham will try to charge you for additional work. They attempted to charge me £1200 for 15 hours work - dominated by tasks such as "tidying up wiring" even in areas I was certain the wiring was fine. Other areas they were keen to charge for, is where work had not been completed due to missing items (that Caterham had not delivered), a bit of a nerve! Some negotiation was required to bring this amount down to something more reasonable. There was part of me that was initially outraged, but in reality this work, done by people who work with these cars every day, should give me a better car at the end of the day. The big concern going to the PBC was the non-fitting nose cone. I have had a brief chat with Caterham about this and apparently they removed some material where the nose goes over the ARB, to allow more space to bend the nose into shape. From the pictures I've seen it looks pretty good. I had considered fitting paint protection film myself, but after a bit of research and a few horror stories I was convinced otherwise, especially as I struggle to make the screen protectors for a phone sit flat! The compound curves of the nose cone and the rear arches, filled me with dread, so I left this one to the experts. Premier Paint Guard fitted new Suntek PPF C film to the car, which you can hardly see. This is supposedly a new technology and supersedes the 3M film, all I know is it looks pretty good - I will report back later on the job it does protecting stone chips etc. In other news, I've gone for a personalised plate for a finishing touch! This is because, I had the build completed in the week following the Easter weekend (roughly 1st April) and then the waiting for Caterham to come and collect the car began. The car was collected on the 29th of April. Having put the roof and doors on it, I was amused by how challenging getting in and out of the car became. With that in mind I decided not to drive it up the ramp into the truck, as I didn't want to embarrass myself trying to get out in a restricted space! Waiting to load on a surprisingly cold morning for the end of April! 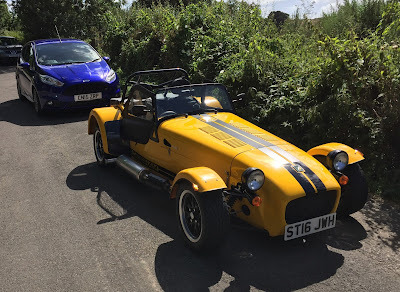 The guy collecting the car was very friendly, with stories of recently delivered Caterhams both to my local area and the Cairngorms (made me rather jealous). His words of warning were less encouraging with an estimate of ~85% of cars failing the IVA first time around. Apparently the main reason is the inconsistencies often found in the braking system. There's not a lot anyone can really do about this, the newly assembled brakes need time to bed in and find their balance; realistically that would take 50miles or so. This week is the week of the PBC, hopefully all goes well. On Saturday the paint protection film is to be installed - I hope to have a few pictures of that. If the PBC is completed this week then the IVA will follow shortly afterward and the car will return! Insurance - this is a tricky area if you are 23... Not many insurers will cover Caterhams for a start and then of those that do, many are restricted to 25+ or even 30+. On this note many companies will offer a discount for club membership and it can be pretty substantial. I think the reduction in premium I found paid for the membership; happy days! Number plates - I did not fancy drilling through the fibreglass to attach the plates, especially with the thought of the plates getting caught on something and damaging the nose. Inspiration came in the form of some 3M strips my Mum was using to attach pictures etc to the wall with. There were two sticky sided strips one for the wall and one for the item to be hung, each had a velcro like surface - but a stronger velcro, akin to the pads on the Momo steering wheel. A little bit of research revealed many forms of these pads and they seem ideal for having the number plate attached so it won't fall off, but will yield if the number plate hits something. It also has the added bonus of making the plate removable for track days. Speaking of track days, I'm hoping to get the car out on the track at Castle Combe on 19th June for the Under 17 Car Club charity day. I'm also debating the Classic, Kit and Retro Action Day at Castle Combe the following weekend - it is very tempting!! I apologise for the delay, I was waiting until I had some decent pictures of the finished car out of the garage - not always easy with the British weather! Finishing up jobs included poppers for the door catches - easy enough if you take advantage of the fact the tabs can be removed from the door to fit the poppers. Wipers - now these are a bit of a pain, as the spring that holds them on the wind screen is surprisingly strong. I would advise covering the area around the wiper mounting with card/bubblewrap to protect the surface if the spring contracts. Getting them lined up just right took a bit of trial and error, but they look alright now. One job I had missed was earthing the fuel tank. I would not advise missing this job! Ensure you fir the earth wire to a nut on the rear wheel arch attachment - and, yes, of course it will only reach the most awkward one to get to! Nearly forgot; the boot carpet, must give thanks to Mum for this one. Cutting all the little panels to fit and fitting them in place with glue is a little fiddly. One good tip for the pieces that sit in corders is to bend them on the obvious seam and weigh them down over night to get them to form to the required shape - thanks Mum. The boot carpet interaction with the fuel filler cover caused a bit of head scratching; in essence the flanges for the screws should be under the carpet while the front edge should be used to hold the carpet down. With the last little bits tidied up, it has been driven - basically back and forward up the drive, but reverse, and first work! As do the brakes and the handbrake, so pretty pleased with it. Many pictures below. Big thanks to all those that helped along the way and a special mention for my Grandad without whom, this may not have been possible and certainly would have taken much, much longer! Kept me going through cold, challenging weekends and made the experience all the more enjoyable, thank you! The hood posed an interesting challenge. It was a very tight fit and definitely required two people just to get it loosely in place. We managed to get it in place "good enough" to fit the doors. A piece of advice for the doors is to ensure the hinge that you fit to the door is drilled through the metal piece which runs around the edge of the window. This metal is very hard and is a bit of a pain to drill. I have left the hood to try and stretch it into shape. and the doors still need the retaining poppers fitting. It was while we were waiting for the hood to stretch in place that the car was lowered onto its wheels for the first time. This made it look very small; it's so low! There are still a few issues to tackle; like the remaining tasks on the hood and doors and an issue I have with the engine idling. It seems to be unstable at idle. It had this issue at 900RPM, so I adjusted the throttle and it still has the same problem at 1100RPM. It seems to phase up and down in revs, like their is an inconsistency in fuel flow. To me it seems like and ECU issue - the controller gains not setup properly?